Leica Microsystems has introduce the modular Leica DMi8 inverted microscope platform for industrial applications. Inverted microscopes are used for metallography, quality assurance in medical device or microelectronics manufacturing, a wide range of inspection tasks in the automotive and aviation industries as well as materials science. 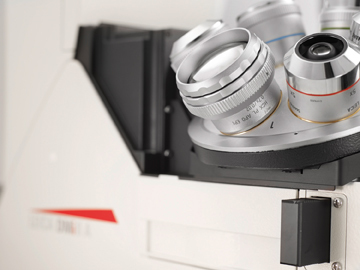 The Leica DMi8 makes it possible for users to configure a basic microscope system now, and upgrade later as needs and applications change. In addition, users can speed up their workflow, because working with an inverted microscope makes sample placement and change between samples faster than in upright microscopy. They can also image large and heavy samples more easily. Additionally, the Leica Application Suite (LAS) software guides novice and expert users through the analysis step by step. Leica Microsystems’ exclusive macro objective for the Leica DMi8 offer a field of view of 35mm. This is four times more than a standard objective. To see even more details of the sample surface in high contrast, users can also use the new Ultra Contrast 3D Illumination.